Q. 1. When refund application on account of excess payment of tax can be filed? Q. 2. Who all can file refund application using ground as “Excess payment of Tax”? Q. 3. What is the minimum amount that can be claimed while filing refund application using ground as “Excess payment of Tax”? Q. 4. What are the relied upon documents which I have to upload with refund application on account of excess payment of tax? Q. 5. To whom should I file my application with? Q. 6. Can I file for multiple tax period in one refund application? Q. 7. Can I save the application for GST refund? Q. 8. Do I need to upload any statement of invoices for claiming GST refund? Q. 9. Can I preview the GST refund application before filing? Q. 10. How can I track the status of application for refund? Q. 11. What is ARN? Q. 12. Where can I download my filed refund application? Q. 13. What happens when refund application is filed? Q. 14. Whether there is any ledger entry on filing refund application? Q. 15. When / how will the refund Form RFD-01A be processed? How can I file application for refund on account of excess payment of tax? Ans: Refund application on account of excess payment of tax can be filed, when the taxpayer has paid excess tax (in the form of advance tax or tax deducted/collected at source or self-assessment tax or payment of tax on regular assessment) against the tax required to be paid by him. Ans: Refund can be claimed for the amount of Rs.1000 or more while filing refund application using ground as “Excess payment of Tax”. Ans: The taxpayer shall file the refund application in Form RFD-01A on GST portal. Taxpayer shall choose ground of refund as “Excess payment of tax” for claiming refund. After filing, refund application shall be assigned to Refund Processing Officer and refund applicant can track the status of refund application. Ans: No, you cannot file for refund of multiple tax period in one refund application. One refund application can be filed by the taxpayer for a month for claiming refund of excess amount paid. Ans: No statement template is available for uploading the invoice details for claiming refund. You need to mention the refund to be claimed details in the statement 7 available on the refund application screen while filing refund application. Ans: As the taxpayer is claiming refund of the tax amount paid, there is no ledger entry in Electronic Credit Ledger/ Electronic Cash Ledger. 3. The Select the refund type page is displayed. Select the Excess payment of tax option. 5. Select the Month for which application has to be filed from the drop-down list. Note: You should have filed all the required returns till date to file refund application. 7. 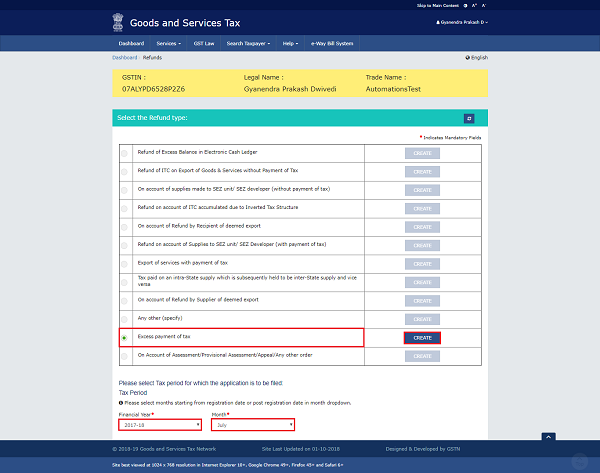 The GST RFD-01A – Excess payment of tax page is displayed. Note: Based on the tax period selected, ARN of Form GSTR-3B/ 4/ 5 along with other details gets auto-populated from the database for which taxpayer can claim refund. 8. Enter the tax amount paid in excess which needs to be claimed in the “Details of excess payment of tax” Table. 9. 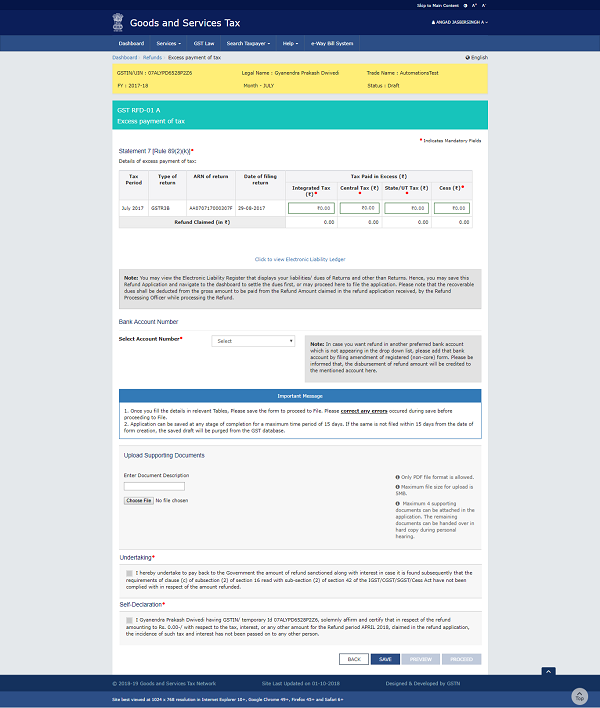 You can click the hyperlink Click to view Electronic Liability Ledger to view details of Electronic Liability Ledger that displays your liabilities/ dues of Returns and other than Returns. 10. Click the GO BACK TO REFUND FORM to return to the refund application page. 11. Select the Bank Account Number from the drop-down list. 12. Under section Upload Supporting Documents, you can upload supporting documents (if any). Note: To view your saved application, navigate to Services > Refunds > My Saved / Filed Application command. 16. Click the PREVIEW button to download the form in PDF format. 17. Form is downloaded in the PDF format. 18. Select the Undertaking and Self-Declaration checkbox. 2. The success message is displayed and status is changed to Submitted.Application Reference Number (ARN) receipt is downloaded and ARN is sent on your e-mail address and mobile phone number. Click the PDF to open the receipt.